Gold has failed to maintain the recent corrective bounce, with prices falling sharply in increased volatility. 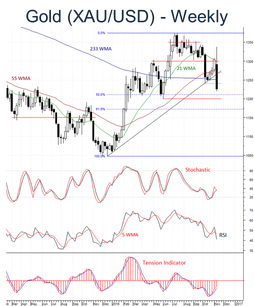 Falling momentum studies and the close below the USD1241.20 low of October suggest further downside risks towards the USD1218 retracement, with potential for extension to critical support at the USD1199.60 low of May, as investors turn cautious once again. A close beneath here, however, will confirm extension of the July bear trend, with subsequent losses then opening up the USD1180.50 retracement as investors adopt a bearish stance. Resistance is lowered to USD1241.20 and extends to congestion around USD1270. A close above here would help to improve price action, but cautious investors are likely to keep any immediate bounce capped beneath here.